And admitted it's at vault. Just when you think it couldn't get any worse for Bethesda, it goes and leaks a load of personal user information to other customers. The data protection breach happened last night, as customers filing support tickets with Bethesda began receiving support tickets from other people, too - which included usernames, names, addresses and other contact details. 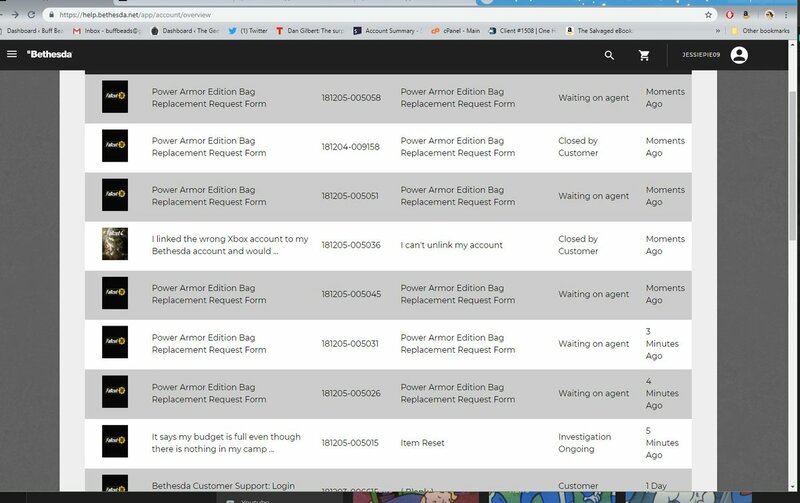 Screenshots posted to Twitter showed customers had somehow been given access to details usually confined to Besthesda's own internal customer support system - which was full of complaints about those damn Fallout 76 bags that Bethesda is now going to replace. The majority of complaints were about Fallout 76, but customers writing in with other issues also had their details exposed. On Reddit, someone with access to the system said they could see the last four digits of another customer's credit card number. Bethesda has not yet said how this all happened, but has acknowledged the incident, apologised, and said it acted quickly to seal the breach. "We experienced an error with our customer support website that allowed some customers to view support tickets submitted by a limited number of other customers during a brief exposure window," Bethesda said in a statement released on Twitter. "Upon discovery, we immediately took down the website to fix the error. "We are still investigating the incident and will provide additional updates as we learn more. During the incident it appears that the user name, name, contact information, and proof of purchase information provided by a limited number of customers on their support ticket requests, may have been viewable by other customers accessing the customer support website for a limited time, but no full credit card numbers or passwords were disclosed. We plan to notify customers who may have been impacted. "Bethesda takes the privacy of our customers seriously, and we sincerely apologise for this situation." It's another slip-up in what has been a disastrous launch for Fallout 76. Bethesda has promised fixes on the way for the game itself - although it'll take more than a fresh patch to regain the trust of fans left burned by this latest debacle.